My name is Simone Onorati and I am from Rome, Italy. I began in the industry nine years ago in a family business, because a lot of my family works in hospitality. Passion came later when I understood that making cocktails is not only about a drinking experience, but the way it connects you with people. In Rome, I studied at the Bar Academy and began working in bars and then moved to Sicily for a while. My next stop was London to improve my English and understand British culture which is different from our Southern European one. I created my own network and moved to different places in London. 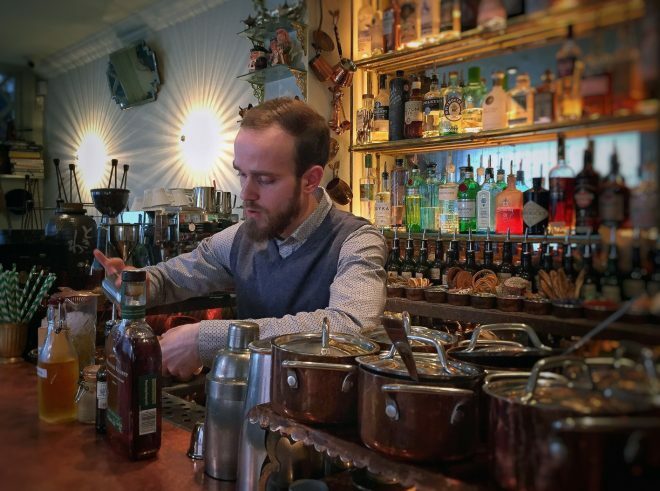 The real step for my career was when I joined Dry Martini in London, where I learned a lot about bartending: you are a host, a knowledgeable person, and a good mixologist. And of course, it’s about team work in the end and I learned that too… it was an incredible team. After Dry Martini I moved to The Gibson just over a year ago, which is also a great bar thanks to the people who work there. We all have a strong connection, just like the one I still have with my former colleagues who moved to Scarfes. My dream bar will be in Italy, a country with such potential for cocktails and also as I am such an Italian guy I would like to bring back my knowledge to my home. I’d open a bar that serves classics with a slight twist, then have one or two cocktails on the menu that are really different to make the audience discover them. My bar will be build around the people. They have to be part of it, they are going to be part of their own experience. So it would be a small place with 40 seats like The Gibson and I’d let people be a part of the drink making, like helping with the garnish. And of course I would serve food in my bar, I am Italian. I love to go to the cinema. Otherwise I do research on cocktails, and I read a lot of books about drinks and spirits. Scotch whisky is the one. More Islay style, as I like peaty and heavy. I love to redistill spirits too, but I respect whisky so much that I’ve never distilled it, not even used it for an infusion. It takes so many years to mature a good whisky I don’t think it should be altered. First of all, when I build a drink, I think about what message I want to send to my guest, what is the emotion I want to give. What can I tell the guest when I bring the drink to them. For me, the story makes the cocktail. Acidity is one of the key elements of a drink. Vinegar is part of that family and I love it. If you come to my house there is an entire shelf filled with jars and bottles of nothing but vinegar. So of course, I love shrubs. At The Gibson, we have one hundred different vinegars, from shiso vinegar to more classic vinegars. Definitely Scarfes is my first choice as I have a lot of friends there, go to see Craig Petrie and my second choice would be Nightjar.